The House on Wednesday passed a spending bill that included full-year appropriations for a portion of the government and stopgap funding for the rest of federal agencies, sending the measure to President Trump for his signature ahead of a Sunday shutdown deadline. The bill lawmakers approved on Wednesday included full, line-by-line fiscal 2019 spending levels for the departments of Defense, Labor, Education, and Health and Human Services. It also included a continuing resolution to provide funding at fiscal 2018 levels through Dec. 7 for agencies that have not yet received regular appropriations. Trump has already signed into law a “minibus” bill setting spending for the departments of Energy and Veterans Affairs, as well as the legislative branch. 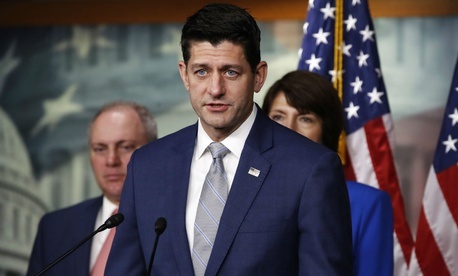 Ryan expressed his optimism that a shutdown would be avoided despite Trump last week calling the minibus-plus-CR bill “ridiculous.” The president’s criticisms focused on the lack of funding for his proposed U.S.-Mexico border wall, which he would like to see prior to the upcoming midterm elections. The Homeland Security Department would be one of the agencies operating on a continuing resolution if Trump signs the second minibus into law. On Wednesday while answering questions from reporters in New York, Trump signaled that he would sign the bill: “We’re going to keep the government open,” he said. Lawmakers on Wednesday boasted of their accomplishments, noting that it had been 22 years since they last successfully passed as many full-year appropriations on time. If Trump signs the bill into law, the Defense Department will not be operating on a CR for the first time in 10 years. The Senate last week easily approved the bill. Democrats celebrated that the final bill, which went to conference committee after the House and Senate passed their own versions of it, was stripped of “poison pill” riders and fully funded agencies over Trump’s objections. “I am pleased that Congress has resoundingly rejected president Trump's budget,” said Rep. Nita Lowey, D-N.Y., the top Democrat on the House Appropriations Committee, on the floor. If Trump does sign the bill, the departments of Treasury, Commerce, Justice, Agriculture, State, Interior, Transportation, and Housing and Urban Development would join DHS and agencies such as the Environmental Protection Agency, Office of Personnel Management and General Services Administration in operating under a CR until early December. Those agencies account for just 25 percent of annual discretionary spending, Ryan said. Congressional negotiators are currently in conference over a third minibus that includes funding for Agriculture, Interior, Treasury, Transportation and HUD, as well as OPM and GSA. That measure would provide the vehicle for a pay raise for the federal workforce, if lawmakers choose to include one. The Senate version of that bill included a 1.9 percent raise. The second minibus that lawmakers sent to Trump on Wednesday budgeted for such an increase, but final authorization would still have to come from the other bill.